Blazing Saddles began operation in Jun 1992. 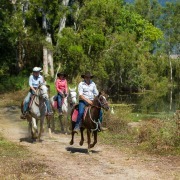 Proprietor Peter Trout, a very experienced horse handler, relocated his half-day horse riding adventures from Mungalli Falls on the Atherton Tablelands, to Palm Cove which is an incredibly beautiful and diverse place only 20 minutes north of Cairns. 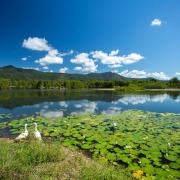 In December 2005, he moved to a bigger ranch just west of Kuranda west of Cairns, then on 15th August 2012, he moved again down to Yorkeys Knob - only 10 minutes from Cairns city. A small family company starting out with only 20 trail horses has now blossomed into a totally professional outfit with over 60 horses and more than 16 staff members. Horses are selected individually for their gentle nature, with trail safe horses to suit any level, any size and (almost) any age. Blazing Saddles can take riders as young as 4 years of age. 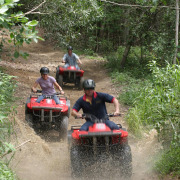 Following the success of their horse riding tours, Blazing Saddles diversified into a Outback and rainforest adventure of another kind using ATV’s (stands for All Terrain Vehicles) which are 4 wheel motor bikes also called Quad bikes. In November 1998, they began operation of 10 All Terrain Vehicles. 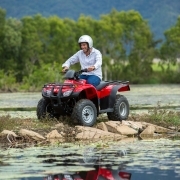 Since this time they have expanded to cater for up to 30 ATV adventure seekers per tour. Blazing Saddles are able to cater for large groups, however most tours are conducted in more manageable numbers of between 6 and 12 riders.